How do I find who I’m looking for? There are a number of ways, but the search function provides the most straight forward method. The advanced search form allows you to enter information about the individual you’re looking for and presents you with a list of possible matches from the database. How do I find an individual’s ancestors? Once you locate an individual, the easiest method is to press the Ancestors tab. This will show you a graphical display of both the paternal and maternal ancestors of the person. 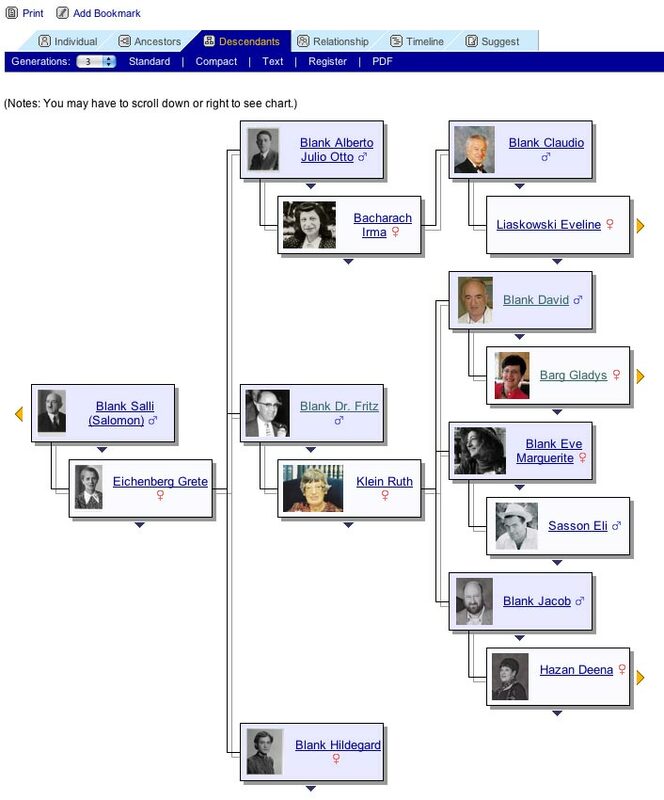 Once you have the ancestor chart displayed, you can change the number of generations displayed. You can click on the arrows located at the far right ancestor if you need to see additional ancestors. There are a number of formats for you to choose from - Standard, Compact, Box, Text, Ahnentafel, Media and PDF. Try clicking on the various options and see which one works best for you. What if I want to see an individual’s descendants? The tab marked Descendants can be used to display the descendants of an individual. Again there are a number of formats - Standard, Compact, Text, Register and PDF. The Standard view is a graphical chart. If you are in the Text view you can click the small icon beside any name to get a graphical chart showing the descendany from the first person to the person of interest. A chart similar to this will appear. You can mouse over the blue downward arrows to see details about a person. Click the yellow left or right facing arrows to move to descendants or ancestors of the person. Is there a way to tell if two individuals are related? Yes, the Relationship tab will show a graphic display of all the people between two relatives. To use this function, locate the first individual and then press the Relationship tab. Then use the Find button to locate the second person to be displayed. Once you have the two people selected click the calculate button to display their relationship. The Timeline function looks interesting, what is it? 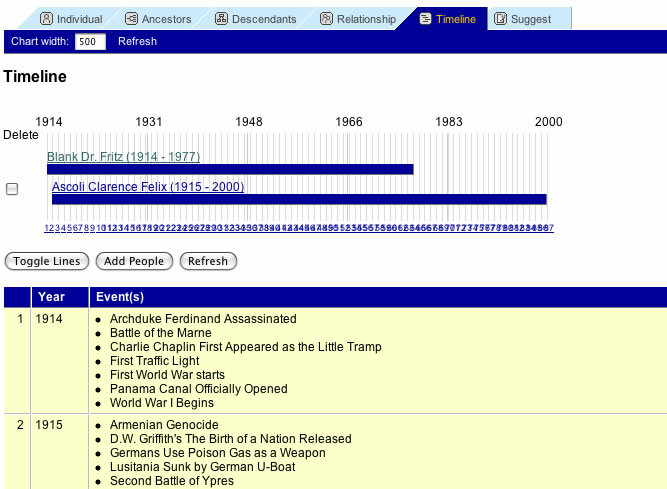 A timeline is displayed for an individual when the Timeline tab is clicked. The time line shows important events in history that occurred during the life of an individual or a group of individuals. You can add more people to the timeline using the "Add People" button. It gives you a unique perspective to see what was going on in the world during the lives of our ancestors. Hover the mouse over a bar to see the life details for that person. If I see a mistake in the information presented can I correct it? The suggestion tab allows you to send corrections, updates, comments or any other information to the database administrator. Information on which individual you are referencing is automatically attached to the message when you make a suggestion using the Suggestion tab. The database administrator will take your suggestion and add it to the database in the next web update cycle. Is there a way to print the display without all the headers and icons? Yes, just click on the Print link located above the control tabs. A format that is simplified for printing is displayed and you can use the print function of your browser to print the page. The other link above the row of Tabs is "Add Bookmark". This allows site visitors to save a bookmark to any page on this site to their own computer, to allow the visitor to be able to return to the same page within this site. The list of saved bookmarks for each user is available by clicking the "Bookmarks" link at the top of the page (see below). Please log in link takes you to the Log In page where Registered users can log into the site. Registered users who log in are able to see the details on Living people. Home takes you to the Home page, where you will find a summary of the contents of this site, some statistics about the site, and listings of people who have a birthday, wedding or death in this database, as well as a photo and document from the database. What's New is a listing of new additions to the site made in the last 45 days.It is divided into sections for Photos, Documents, Headstones, Histories, Individuals and Familes. Photos is a listing of all of the photos in the database showing who and/or what that photo is linked to. Documents are images of documents used as source material on the site - eg copies of birth, marriage, death certificates, Witness Testimony Statements etc. Military Documents are images of documents that relate to a person's Military History - enlistment, discharge papers for example. Holocaust Documents are images of documents that relate to the Holocaust - deportation, transportation documents for example. Histories are articles and stories about people, families and or places. Headstones are photos of headstones for deceased people. Holocaust Victims is a listing off all those in this database identified as being a victim of the Holocaust. Places is a listing of all the places in the database. Many of them are linked to a Google map showing where the place is. Bookmarks is a listing to the Bookmarks a site visitor has saved. Note that the bookmarks are stored on the user's computer, and so are only visible to that user. Search takes you to the Search Page where you can search the database for names, places, events, facts and notes.